Dr. ROLAND KAYS, PI on the project, Director of the Biodiversity lab at the North Carolina Museum of Natural Sciences and professor at NC State University. Roland has been working in Panama since 1993, when he started his research on kinkajous. Dr MARTIN WIKELSKI, PI on the project, director of Ornithology at the Max Planck Institute in Germany. Dr. PATRICK JANSEN, PI on the project, Vertebrate Program Coordinator at STRI, and also with the University of Groningen and Wageningen University. Started working in Panama in 2004. Dr. BEN HIRSCH, post-doc on the project. 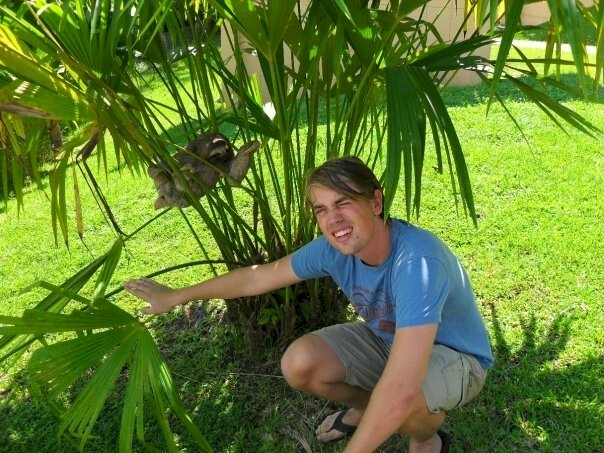 He did his PhD on coatis in Argentina, then spent a year working on coati genetics at the Smithsonian Conservation Genetics Lab in Washington D.C. before moving to Panama. 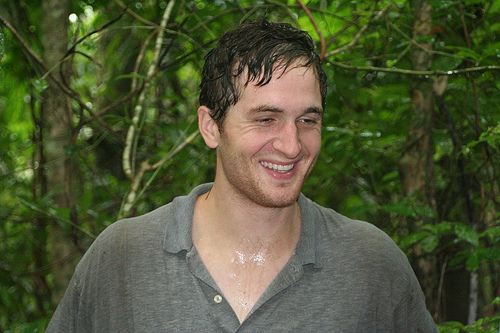 MATT McELROY (2009), former field assistant on the project. Matt is a Berkeley grad and has a background in herpetology. BART KRANSTAUBER (2008), database manager, and former intern on the project. Bart, here with Jorien, studied mammal community composition with camera traps, as part of the MSc at the University of Groningen, the Netherlands. WILLEM-JAN EMSENS (2010), intern on the project. Willem is studying burrowing behavior of agoutis and directionality of seed movements as part of his MSc at Wageningen University, the Netherlands. LIENEKE BAKKER (2010), intern on the project. Lieneke is comparing seed dispersal between three rodent species, as part of her MSc at Wageningen University, the Netherlands. JORIS BUIS (2009), intern on the project. 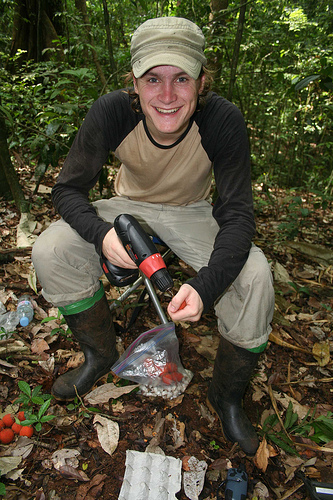 Joris is studying hunting strategies of ocelots, as part of his MSc at Wageningen University, the Netherlands. ANNEMARIE WINKELHAGEN (2009), former intern on the project. 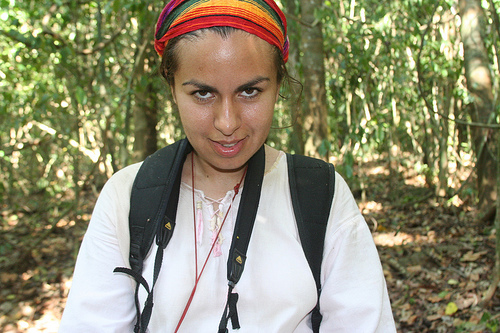 Annemarie studied agouti reponses to fruiting of Dipteryx panamensis, as part of her MSc at the universities of Amsterdam and Wageningen, the Netherlands. VIVIAN MAAS (2009), former intern on the project. Vivian studied, partitioning of fruit resources by mammals, as part of her MSc at Wageningen University, the Netherlands. TORREY RODGERS (2009), former volunteer on the project. Torrey, from Colorado USA, helped out during the time seeds were moving like crazy. LENNART SUSELBEEK (2008-2009) former intern on the project. Lennart studied activity patterns of agoutis and did a camera trapping study of pacas, both for his MSc at Wageningen University, the Netherlands. JORIEN VAN KOTEN (2008), former intern on the project. 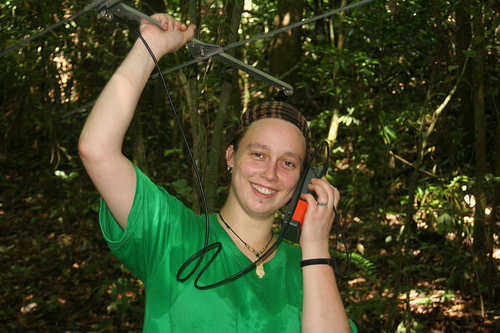 Jorien studied responses of agoutis to bait and live traps, as part of het MSc at Wageningen University, the Netherlands. I am currently a University student seeking to do a project similar to this for graduate school and would love to learn more about the process and the work that you are doing. Are there any intern/volunteer positions available?